// Where will the platform industry be in five years’ time? For the last 10 years we’ve produced annual five-year projections based on industry trends and the economic outlook and their likely impact on the platform industry. 2018 has been a challenging environment for the industry with some platforms taking a far larger slice of the action than others. Despite the challenging environment, the overwhelming consensus from platform leaders is that platforms that can support advisers to support their clients have a long-term sustainable future. The idea that scale is the only critical success factor in the platform industry has been debunked time and again, most recently by mid-sized Transact which successfully launched on the London stock exchange and is one of just a few profitable and sustainable platforms in the UK. Cofunds, meanwhile, has been brought into the Aegon fold and is struggling to hold on to customers and assets following a series of missteps that were both technology and service related. The successful platforms of the future will be able to harness technology to deliver greater efficiences, product innovation and able to rapidly adapt to the ever-changing needs and demands of advisers and their clients. Service will be at the core of their organisations. Everyone talks about consolidation. All the time. And they have done for years. Will it ever happen? No. For every platform lost to the industry, there will be a new one to replace it. In fact, we expect the future to look uncomfortably like the past with an array of different ecosystems that will make it difficult for investors to switch (think Apple v Android) as adviser firms begin to realise the many benefits of being in complete control of their platform and a tightly integrated investment proposition. The focus on tried and tested centralised investment propositions means that much of the breadth and depth that is today found on investment platforms is no longer necessary for many advisers and their clients. Having your own platform à la Succession, True Potential or SJP used to be beyond the means of most regional advice firms, but with the entrance of new API-driven technologies like Seccl and Hubwise, the opportunity to run a tightly dovetailed investment and technology solution that reduces cost, minimises friction and controls risk will be compelling. 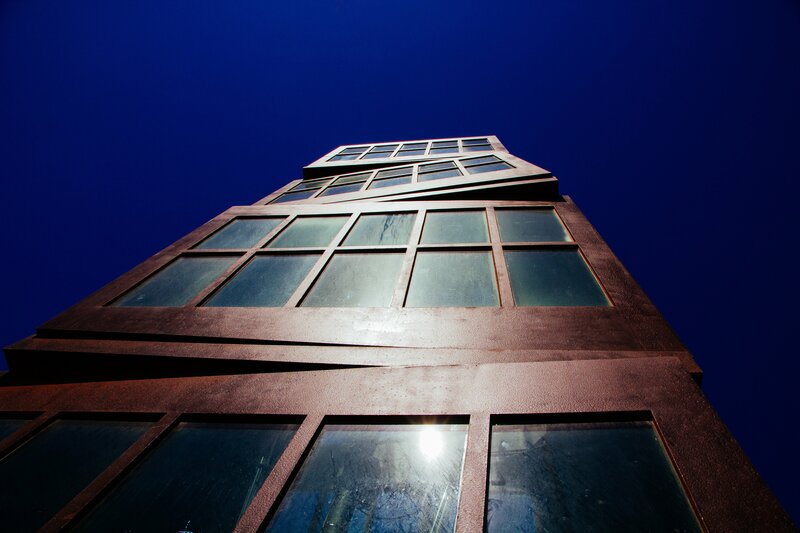 Nearly every platform of the future will be vertically integrated in some way, shape or form — what will change from platform to platform is the degree of integration. While some commentators believe that technological advances will continue to drive down platform costs, it is worth noting that in a siloed environment costs become a less important factor —SJP clients currently pay through the nose and yet it is one of the most successful distributors in the UK. And its customers are incredibly loyal. Go figure. However, the proliferation of ecosystems doesn’t mean that sales will be equally divided. The 80/20 rule largely applies and that won’t change in the future. For the adjacent chart, platforms were ranked by year-to-date net sales and grouped into top five, next five and rest. 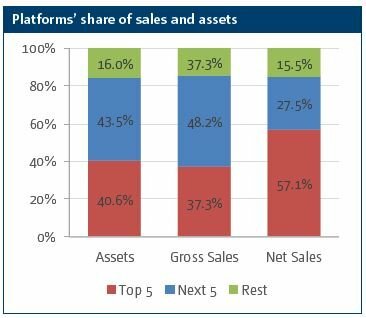 The chart shows that the top five platforms accounted for nearly 60% of YTD net sales and the next five a further 28%, although their share of assets and gross sales is considerably lower. Last but not least, product innovation for the foreseeable future will be focused on delivering tools to help advisers and investors manage and make their pension pots last the exceptionally long decumulation years and beyond. As some plaform leaders have eluded to here, the perfect solutions are still an industry pipedream; the platforms that set the tone and pace of product innovation in this area will benefit the most. sentiment. Since then, the situation has deteriorated. Although the UK has finally reached a deal with the EU, neither remainers nor brexiteers are happy with the terms and the Conservative party has descended into internecine warfare. There is no doubt that the UK is facing a major constitutional and political crisis and the outcome is impossible to predict. On a more prosaic level, it looks as though the DB bubble has peaked or is close to peaking and business is waning. The transfer pipeline has been gushing since pension freedoms were introduced, but it is now slowing to a more reasonable pace. One reason for the change in pace is that advisers have already identified and transferred the potential DB transfer clients in their books. However, the prohibitive cost of PI insurance and the FCA’s intense focus have also acted as a major deterrent for advisers. The platform industry has enjoyed a 10-year compound annual growth rate of 22% and this would normally be the baseline for our realistic scenario. Although we have added the sugar boost of Aegon’s DC assets, we have taken an exceptionally conservative approach and slashed growth rates for all three scenarios. Our pessimistic scenario assumes a forward growth rate of just 5%, putting assets on course for £769bn by 2023. A constitutional and political crisis and/or a disorderly Brexit are the likeliest outcomes, making a deep recession likely. The impact of Brexit will drive up inflation and interest rates may have to rise to counter it, although the economic ramifications of Brexit will give the Bank of England little very room for manoeuvre. The outlook for platforms could be eased by the steady trickle of pension business and the precautionary motive to save and invest. However, higher interest rates and economic uncertainty is likely to keep investors away from investments. Interest rate rises would also put pressure on disposable household income and depress savings levels. Platform activity will be subdued. The realistic scenario assumes a forward growth rate of 9% taking assets to £880bn. This figure may seem high, but experience shows us that even in the worst market conditions, after the initial shock assets resume growth albeit at a modest rate. The growth aspect in particular has been built into later years. Overall, this scenario is only marginally better than the pessimistic one. 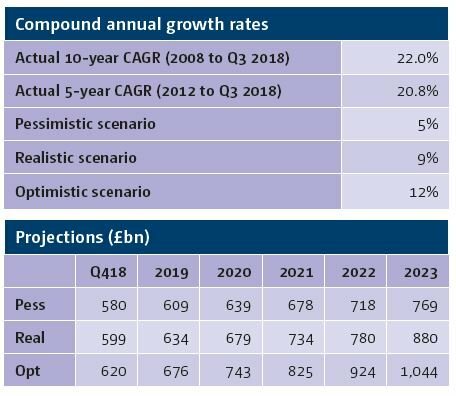 In the optimistic scenario, assets will grow at around 12% to reach £1trn by 2023. For an optimistic scenario this growth rate is unusually low, but given the unprecedented political backdrop, we felt a conservative approach was best. In this scenario, the UK has managed to conclude Brexit negotiations and emerge relatively unscathed from the battle to exit the EU. The impact of Brexit will have a more moderate impact on the economy although an undercurrent of geopolitical risk (particularly US) will be ever present. Channel projections are even more hazardous than industry ones. We expect retail advised business to grow steadily over the next five years predicated on the ongoing demand for pension advice and the cushioning effect of new pension business. 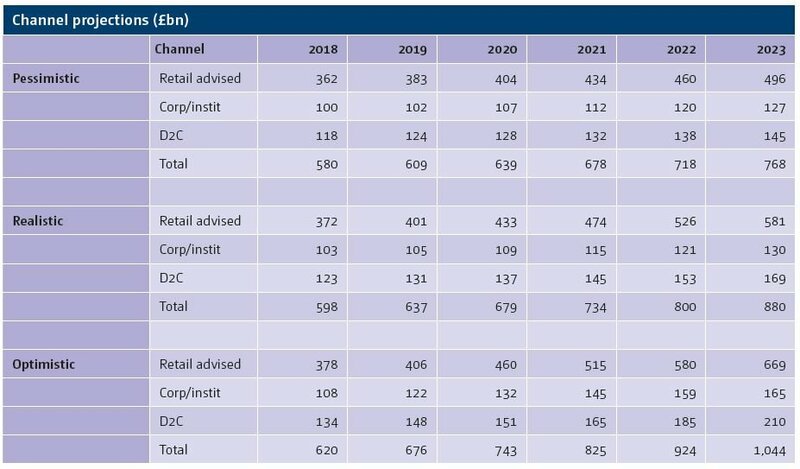 Overall, we expect the retail advised channel and the D2C channels to grow faster than the institutional/corporate channel. Aegon’s DC assets have been added, but as we are yet to understand whether Scottish Widows will be providing DC data in the future, we have assumed a more cautious stance. The comparative success of auto-enrolment will ensure that workplace pensions will continue to grow at a steady pace, but the channel remains under-represented in Fundscape data. The D2C channel has surprised with its robustness these past two years. Sales this year have been strong, despite the economic outlook. Nonetheless, a prolonged and unprecedented period of uncertainty and volatility ill inevitably take its toll on the channel. We’ll be checking in regularly to see how our forecasts are doing. Watch this space.